My MacBookPro decided to die on me. Or rather the battery did. Known problem apparently. But then I am 10 days into a five-week trip, so something one could almost predict. A power shut-down and black screen, but with a battery signalling 92% power remaining, suggests all is not well. I am now in Paris. 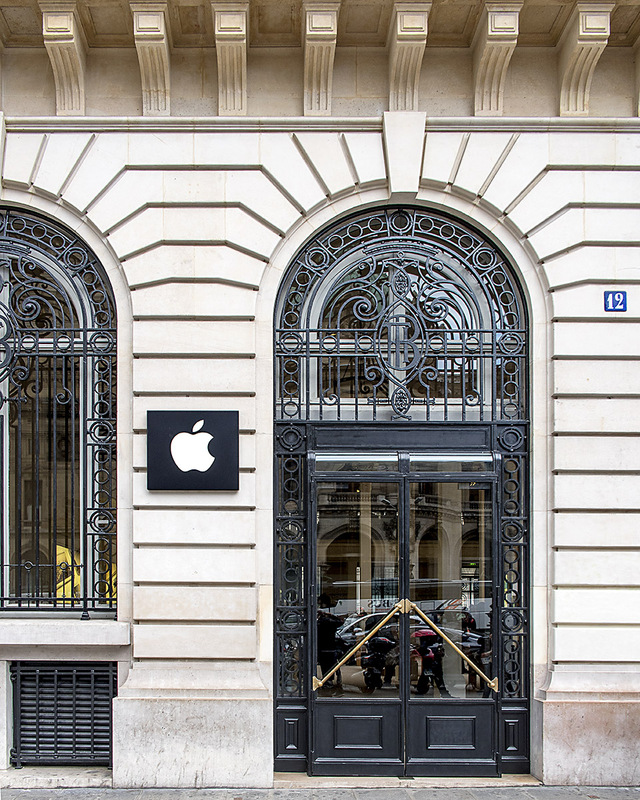 I took it in to The Apple Store at L’Opéra. Within minutes of queuing at the Genius Bar, they could see I had a Worldwide Extended Waranty and today I will collect it in less than 24 hours. It will be complete with replaced top cover, which I had damaged, a new keyboard which in two years I had hammered into several disappearing vowels, and new batteries. Yes, inconvenient, but another example of what I remarked on in my last post on Tesla: Apple, like Tesla, is not just a product. It’s an integrated system that delivers, even when defective. And while I await collection, I can carry on writing up a WordPress post on my iPad. Now I get it. If I had all my photo’s in Apple Photos and not in Adobe Lightroom, you’d be seeing this with pictures stored in their cloud. But for now, back to London and last Saturday afternoon, or perhaps to start with, a little bit further back. Fifty years in fact. As a small boy, going to London’s Euston Station meant one thing. We were off to Scotland for the family holiday. Train was the only way it worked for me. Acute car sickness was an affliction that meant long journeys together in Dad’s ageing Mark 7 Jaguar were out of the question. He would drive up alone, my brother and I would go on our adventure with our mother. We’d eagerly board the train at about 6.00pm. Soon after pulling out of the station, with an impressive outburst of mechanical strength, in a cloud of steam and soot, we’d be called to the restaurant car to eat a three-course dinner. It was such an adventure and so very grown up. We’d then retire to our seeminlgly sumptuous bunk beds for the night’s journey, often after a few rounds of Happy Families, a then-popular family card game. The night might be interrupted by the loss of motion from the long stop at Crewe, then British Railways big interchange station. Crewe linked the East and West Coast main trunk routes. It featured in songs by Flanagan and Allen and George Formby. A few carriages would be uncoupled and a few more added and after the shunting had finished, off we would go again. When we woke the next morning and were summoned back to the restaurant coach for breakfast, the LMS steam engine was puffing its way around the West Coast lochs. I remember the long curves of the 10 or 12-carriage train, poking my head out of the window and feeling the exhilaration of the wind in my face, along with the inevitable grit in my eye from the steam train. We’d finally arrive in Argyle at little Dalmally station after more than 13 hours on board. Here the Station Master would personally welcome the ten to twelve passengers who alighted, as if members of his own family returning. Revisiting London’s train stations today is a big cultural shock. As you approach from the City side to the south, on the face of things, nothing much appears to have changed. But get nearer to King’s Cross. The Great Northern Hotel has no soot on it! 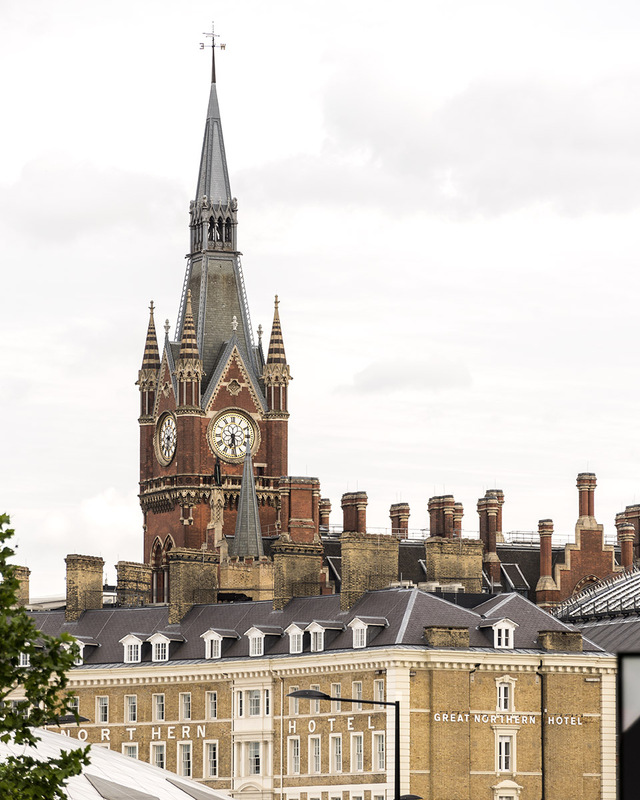 It’s bright clean brickwork and neo-gothic styling from the 1890’s construction is supplemented with glass and steel structures as contemporary as any station in the world. Inside it’s all ultra-modern, with new-gen LCD displays everywhere. 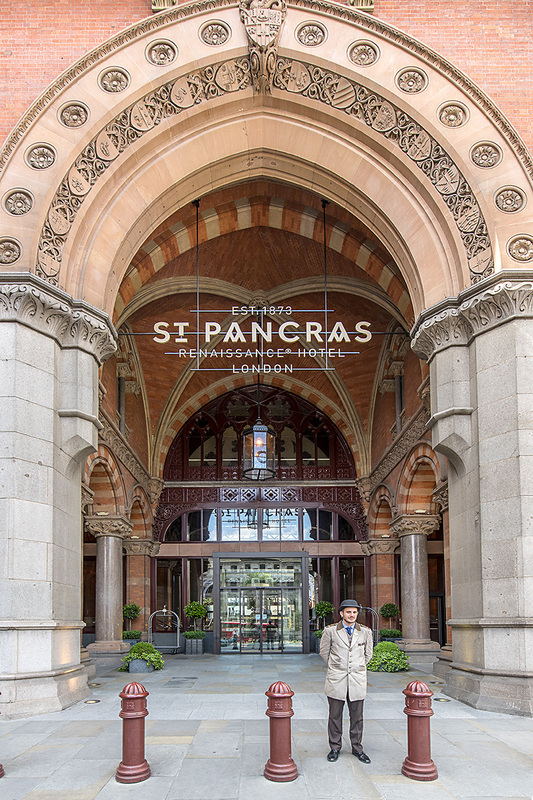 Move over to St. Pancras and the old Station is now the Renaissance St. Pancras Hotel. The old ticket office is now an upmarket restaurant, with contemporary bar and music systems to match. 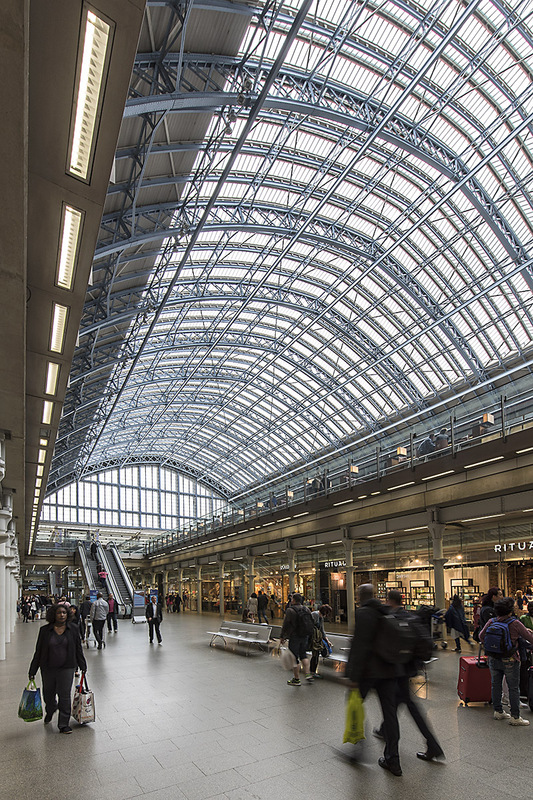 Below, via glass and stainless steel lifts and elevators is the smart new home of St. Pancras International, – the start of the EuroStar routes to Paris, Brussels and Amsterdam. The old tea room is replaced by a plethora of boutique restaurants, coffee shops and major brand gift stores. The restaurants serve top quality gourmet foods. No room for PG Tips tea out of the old aluminium pot from an over-chatty East-end tea lady. No sign of a raincoat-wearing Trevor Howard or Celia Johnson and definitely no Rachmaninov 2nd Piano Concerto as background music. Brief Encounter has given way to Broadway and fine dining. Euston Station itself is the missing link. In an area buzzing with cranes and visible success, Euston is like a time-warp. Its 1960’s terminus was scheduled for redevelopment as part of the now-ailing HS2 (High Speed 2) project. For now everything is on hold. Government, local council Camden, and the HS2 consortium are at loggerheads. The long-promised link from London through the West Midlands, Leeds and Manchester, due to start as early as next year, has no viable London terminus. But at St. Pancras and King’s Cross it’s a different story. Walk out of St. Pancras and a host of new high-rise office blocks is already up. 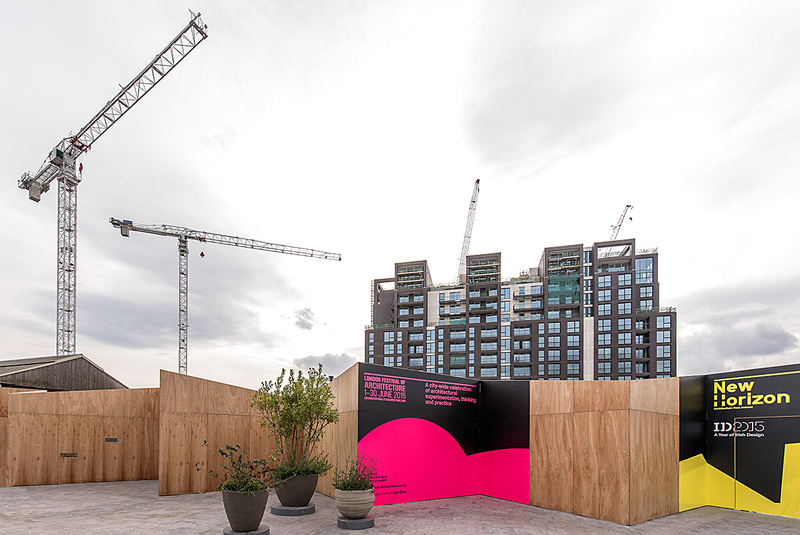 Cranes to the North around the Regent’s Canal reveal old warehouse facades backed by modern new creative arts spaces, housing and cafés. 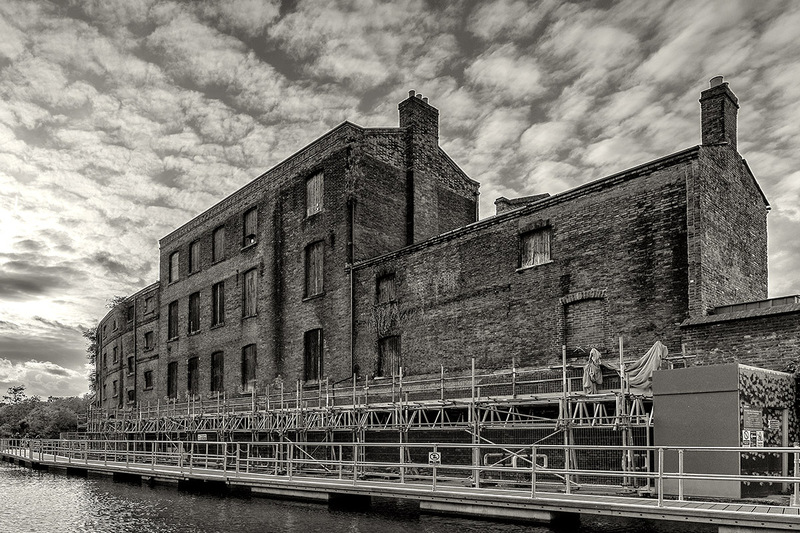 Some are still work in progress and evoke visions of the dark satanic mills of the Dickensian past. 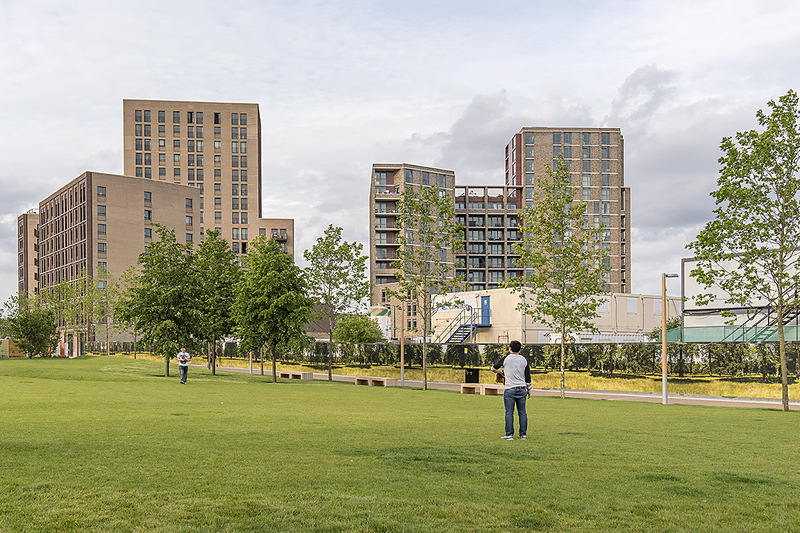 Big open area play-spaces for kids, with fountains and skate board riding areas attract people from many miles away, as it’s served by nearly 15 different bus routes and of course the London Tube. There really are cranes as far as the eye can see. 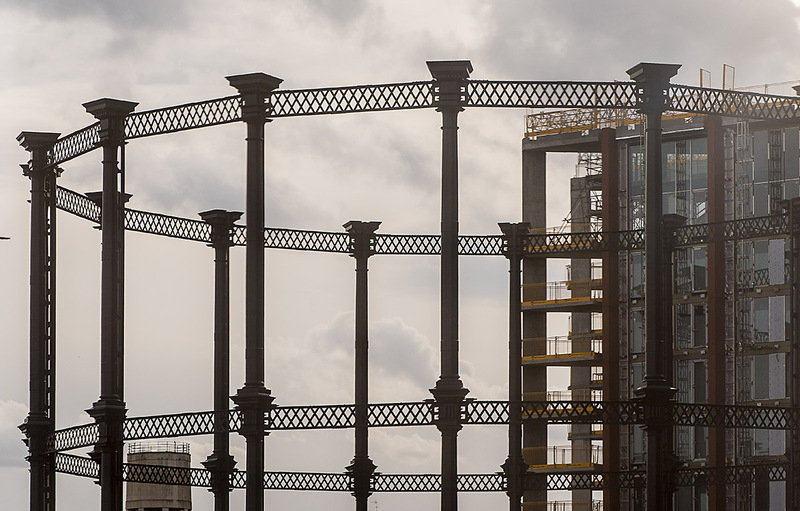 Even the old Gasometer that splits the St. Pancras and Euston rail lines is getting a preservation-led coat of paint alongside super new steel structures to eventully create new housing. As I wander past the door of an experimental theatre centre, I come across Chinese students playing touch football on a newly laid playing field, amidst copious garden plantings and mixed affordable council-owned and owner-occupier properties. 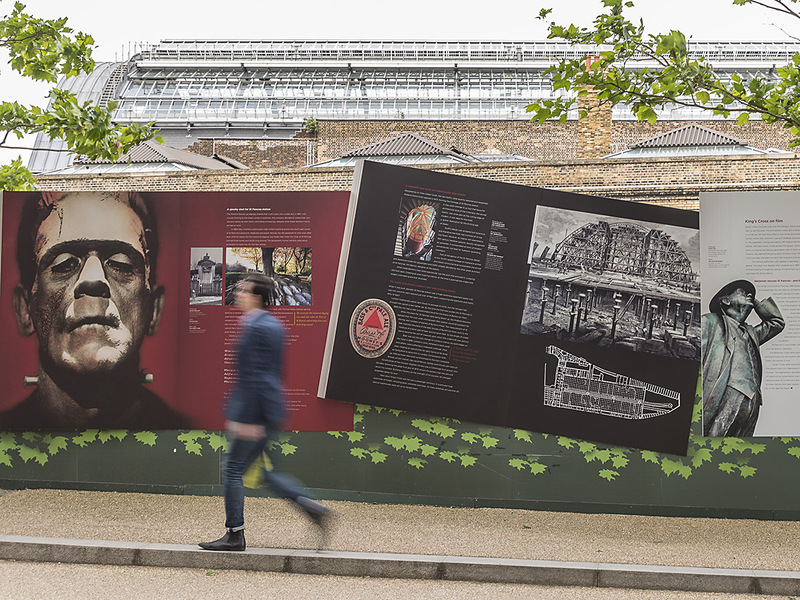 Another sign board announces an Architecture exhibition and prize. Busily working away are people who’ve created models of their planned buildings in the cleared space between old warehouse facades. The only departure from solid signs of progress is a rather too large, too smart Mercedes for the district, with exceptionally dark windows. The unseasonably warm late May evening forces a window to be opened, and in passing one is uncomfortably aware of a financial transaction underway between two rather daunting gentlemen in dark sunglass cover, in return for provision of substances still illegal even in this progressive country. Something made me turn south. 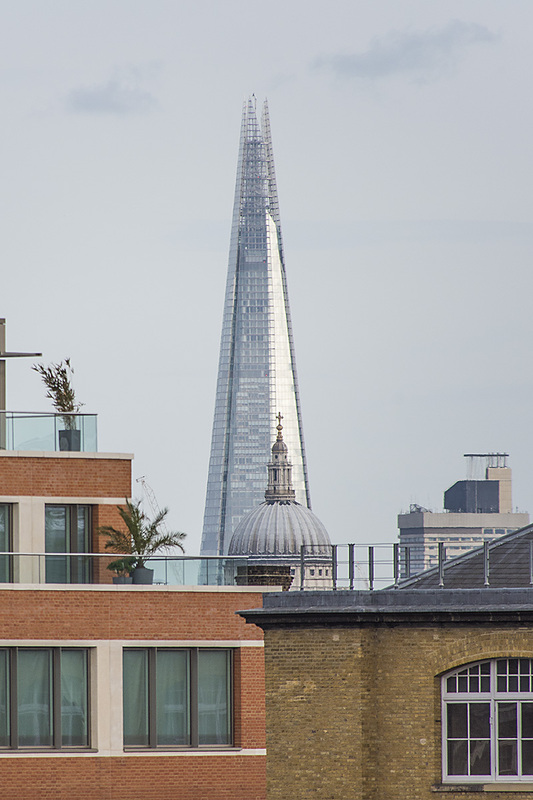 And as I looked across the skyline of cranes, high rises and more signs of generational change in the use of urban space, I realised that the skyline was revealing to me over ten miles of view, over the Marylebone road trio of King’s Cross, Euston and St. Pancras stations, down over St. Paul’s in The City of London and way down south over the river, to London Bridge and the top of the remarkable Renzo Piano building, The Shard. When I grew up in London the air was seldom clean enough to see that far, heralding another change of environmental significance. An Indian restaurant, Dishoom, has a queue of several dozen as I pass. From reviews and friend’s comments this is setting new highs in a food tradition long the backbone of many Londoners, now enjoying a renaissance. People are at last venturing beyond Vindaloo, Beef Madras and Buttered Chicken, to the delights of Punjabi flavours from the north and superb textures from South India. But, as with much in London for Antipodean travellers, all at a considerable price! As I eventually draw closer to home, I pass back by the GridIron building that sits just to the east of St. Pancras and adjacent to King’s Cross. 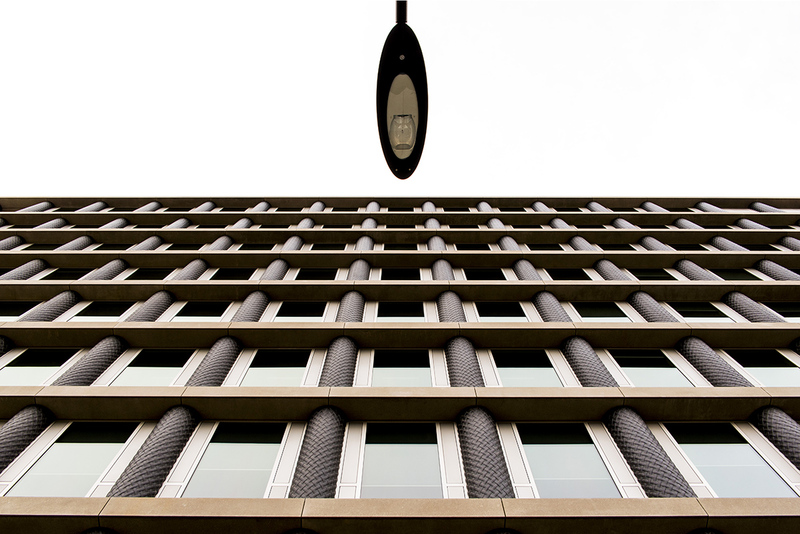 The starkly striking scrolled columns add softness to an otherwise metal facia’d multi-story building, look quite at home in the re-born cityscape. I feel I have unwrapped a brave new world in my journey. I rejoice in how much more one sees on foot than rushing through by taxi or driving. 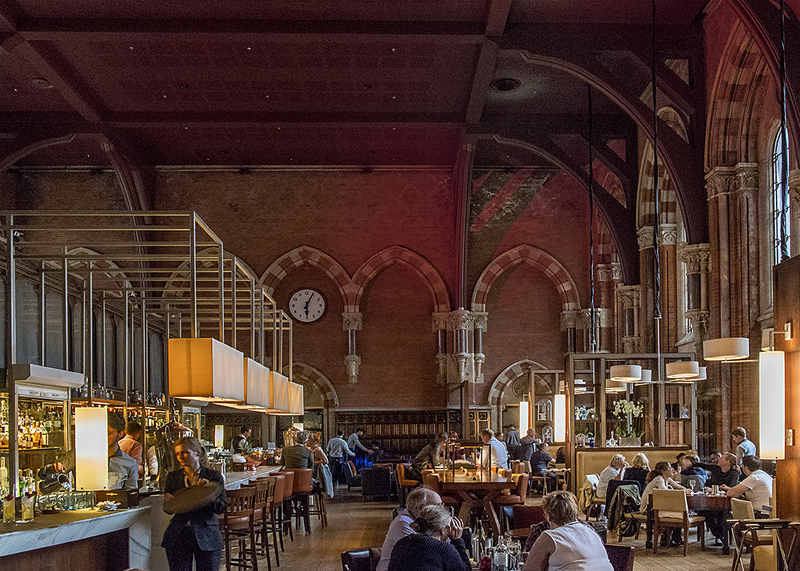 But on return, the comfort of familiarity in the converted St. Pancras Railway Hotel and its wonderfully converted grand spaces into today’s aptly named St. Pancras Renaissance Hotel, is soothing. All text and Images are subject to Copyright of the Author. All Rights Reserved. Wonderful writing John. Such beautiful apt descriptions of the train rides to Scotland and the ever-changing landscapes of the old railway stations in London. I hope you are having a great time. Next Next post: Paris in the Summertime: Fifty years on.